The earth was cursed when man sinned and one day it will be destroyed by fire. 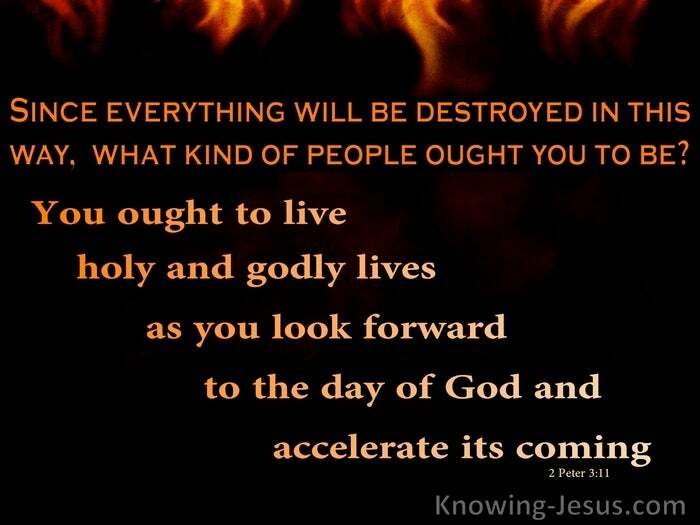 One day everything in this world will be burned-up, consumed, destroyed – gone. One day there will be a new heaven and a new earth where righteousness reigns. One day, at the end of Christ’s millennial rule all will be laid before the Father – and today, God’s plans and purpose are working towards that end. But in the light of this sobering thought, Peter asks a very serious question: He asks each of us to carefully consider what kind of people we should be. He asks us to reflect on how we should live in the knowledge of this truth. He advises that we examine and re-examine our hearts in the light of the end. He encourages holy conduct, a virtuous life – a people set apart in purity of heart. He desires that our conversation and inner thoughts reflect godly conversations. Peter does not spend time giving peculiar details of specific end-time events, but warns us to recognise the approaching season of Christ’s soon return. He knows end-time believers have a greater need than such specific knowledge. He does not fascinate his hearers with exact details of Christ’s second coming.. but he does give one vital warning that we would be wise to consider. 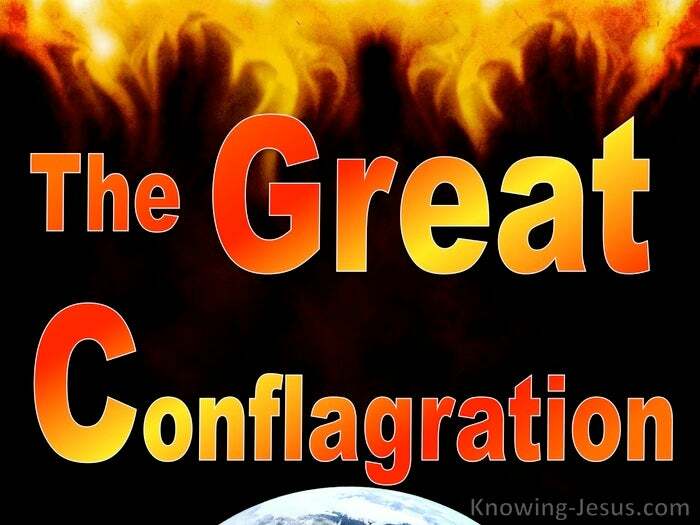 He details one final great conflagration – prior to the new heaven and earth.. where fervent heat explodes as both earth and heaven catch aflame – where heaven and earth are burned up and melt away. And in the light of this brief description, this elderly apostle asks each of us: what kind of people should we be and then proceeds to outline the answer: You ought to live holy and godly lives as you look forward to the day of God. We are to be examples of lives that are holy and characters that are godly. We are to consider our conduct today in the light of future events yet to happen. We are to prepare our hearts for the time when all earthly things will go. The emphasis this dear apostle places, is on our own walk with the Lord Jesus. We should live holy lives- for holiness unto the Lord means sanctification – a transformation into the likeness of Christ through willing submission. Fundamentally it signifies division; being set apart; a divorce from the world. It is a disassociation with the things of the world and the lusts of the flesh. It is a disaffiliation from sin. It is a separation from these things unto God – Oh, we are in the world, but we are not to be of the world. Holiness does not mean unquestioning adherence to a denominational view. It is not linked to canonization of saintly people, who died in the distant past. Sanctification is not achieved through zealous works, designed to please God.. nor is it striving to be a good Christian or a great devotee of Christendom. These are the lies of the enemy that have permeated the religious world. These are myths that have tainted the belief system of many sincere hearts. We should hold the things of this world lightly knowing they are all temporal. We ought to live holy and godly lives knowing that we have an eternal home.. and as we wait for Christ’s return we are to be holy as God is holy. Not through self-effort of self-striving but in submission to the Spirit, looking to Him each moment of the day, moment by moment walking in spirit and truth, as we wait for Jesus.